Location: Home › Music Articles › FreeSlave: A Four Piece Alt-Rock Band Led By "A Bloke In A Wheelchair"
FreeSlave: A Four Piece Alt-Rock Band Led By "A Bloke In A Wheelchair"
Tony Cummings reports on rock team FREESLAVE who are fronted by wheelchair-bound singer/songwriter Haydon Spenceley. 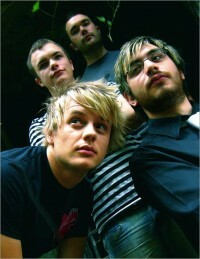 When in 2003 Cross Rhythms last spoke to Haydon Spenceley of alternative rockers FreeSlave they had their debut EP 'Project Freedom' out. A lot has happened since then for the wheelchair-bound singer and songwriter. For a start the original line up of the band all went their separate ways leaving Haydon to gig for awhile as a solo under the FreeSlave moniker and record the album 'Songs For The Dying'. But now FreeSlave proper are back with a new and improved line up (Haydon Spenceley, keys and vocals; Aaron Lewis, guitar; Ben Lewis, bass; and Matt Brombley, drums) and recently released an EP 'Save My Day' (2006) which clearly shows their influences of Muse, Radiohead and Lost Prophets. The band have played numerous gigs at pubs, clubs and festivals across the UK and Ireland (including the Liberty Festival in Trafalgar Square) and TV and radio appearances. About the latter Haydon was keen to explain his perspective to Radio One listeners when he said, "We definitely don't view FreeSlave as a medium for the promotion of disabled rights. But if we have a positive effect by getting out and playing gigs or being played on radio, that can only be a good thing." In an interview on Cross Rhythms Radio, Mike Rimmer asked Haydon how the new line up FreeSlave came together. "It was whilst putting the finishing touches to 'Songs For The Dying' when I was introduced to Matt, Ben and Aaron. So they joined me. During the rehearsals and gigs that followed it became clear that the songs recorded in the studio were starting to come alive in a totally new way. The sound was rockier and punchier than ever, and there was a new energy and raw passion in the band's live sound." Mike asked Haydon whether he was "disabled" or "differently-abled". He responded, "I'm a bloke in a wheelchair. Because it's all just a label, it doesn't really bother me what anyone says. I was told the other day that I'm not allowed to use 'able-bodied' anymore.because that's offensive! And that was by an able-bodied person that was interviewing me for a different radio show! I was just like, oh shut up! Everyone needs labels but really what you need to know is that I have some issues with access to buildings and access to different things in life. As long as I can sort that out it doesn't bother me what you call me." Haydon was asked what is the worst thing that regularly happens to him in being in a wheelchair. "I guess the worst thing that happens on a regular basis is someone expecting me to get really angry about the 'injustices' of my life. As a disabled person, because I can't get into a shop or I can't get on to a train or whatever. And yeah, I don't. I just get on with it. But I don't like the way that people assume causes and they assume that I'm going to be downtrodden. Another thing, I don't want to be too Christian-bashing but when I go to things like Soul Survivor and New Wine and the other Christian festivals that we do sometimes, people stop me and ask to pray for me. That really pisses me off because it just completely negates any form of self-worth. Even though they're quite well-meaning they just don't realise what it does. They kind of assume that I want to be 'better', ie, I must walk. In fact the truth is, I do want to be better. I want to stop swearing!" Mike asked Haydon about the name FreeSlave. "My band is called FreeSlave originally because we worked with a charity called Whizz Kidz in the very first instance, which is going back four years. They're a charity which helps disabled young children with mobility equipment and wheelchairs and stuff like that. I wanted to put across that just because someone was disabled there is no need to become a slave to that sort of life situation or circumstance. You don't need to become a slave to a disability, just like you don't need to become a slave to having green hair being a lawyer or something like that. You can have freedom and just do whatever you feel really. Also there is a Christian connotation. In I Corinthians 9 Paul says that he makes himself a slave to all the people that he's with in order that he win some for Christ. It's kind of depending on who I'm doing an interview with as to which explanation I use." Mike moved on to ask Haydon why he'd called the band's debut album 'Songs For The Dying'. Responded the singer, "Because without wanting to be too morbid, when I was writing the songs there was a kind of theme of death and rebirth. Suffering was in quite a lot of the songs. If you look at the song description a lot of them are about difficult times and people dying and people wanting to die, people feeling as if there's no hope for going on. And yeah, I wanted to honour that in a way. If you're a Christian there's no point just ignoring the fact that people feel like that. Especially if I feel like that myself. If I'm a Christian and I feel like life is crap then I need to be able to express that artistically. I can't just ignore it and go, 'Oh Jesus you're just so wonderful!' all the time. There's no artistic integrity in that." Haydon finished his talk with Mike by talking about the creative influences of FreeSlave. "All of the bands that I like, and I go back to over and over again for listening, have this strong chord or melody structure. I can't listen to something that has no sense of song to it. Sometimes I get angry or whatever and I like to listen to heavy metal or thrash or whatever just to kind of get me through the day. But most of the time the stuff that I would listen to is very much song-based. Quite often when you write, what you are listening to comes out in how you write the song. I want the songs I write to stand up beyond, say, a small group of rock fans. I don't want just rock fans to listen to what FreeSlave are doing. I want older people to be able to listen to it and appreciate the fact that there are good songs even if they don't like the instrumentation so much." Any chance of a review of Songs for the Dying or Save My Day? do you know about joniandfriends.org? its a fine site. Hope you don't mind I'm bringing up the wheelchair but....Joni broke here neck at age 17 and now does work all around the world. I hope you will spread the good word about that opportunity for others to find that site. THANK YOU.